Aamir Khan starrer Dangal is one of the highly anticipated releases of the year. The movie is a sports drama based on Mahavir Singh Phogat and his daughters, Geeta Phogat and Babita Kumari, whom he taught wrestling and who went on to win gold and silver respectively in the 2010 Commonwealth Games. Khan plays the father while his daughters are played by former child artist Fatima Sana Sheikh and debutante Sanya Malhotra. Sakshi Tanwar, Vivan Bhathena and Rajkummar Rao comprise of the supporting cast. The movie is directed by Nitesh Tiwari and produced by Walt Disney Pictures, Aamir Khan Productions and UTV Motion Pictures. Comprising of seven tracks, the album is composed by Pritam and penned by Amitabh Bhattacharya. The rusty tone of the album is refreshing whilst the lyrics are gusty and impactful. BollyCurry gave the album a listen and here are our thoughts. The album opens up with "Haanikaarak Bapu" sung by Manganiyar child folk artistes Sarwar Khan, Sartaz Khan Barna and Saddy Ahmed with additional vocals from Kheta Khan and Dayam Khan. The lyrics are quite funny and definitely the star of this song. The music with its Haryanvi roots compliments the song perfectly. This is one song that resonates with every person who has or had a strict and disciplinarian authority in their life. The second track is "Dhaakad" sung by Raftaar. Aggressive and rough, this song conveys the fighting spirit of the female wrestler. The hip-hop music blends well with the Haryanvi music making it unique to the ears. Another version of the same song sung by Aamir Khan is also a part of this album. The next song in line, "Gilheriyaan", departs from the style of the above two and turns out to be a generic casual song. Sung by Jonita Gandhi the tune is soft on the ears. Bollywood has churned out many songs similar to this in the recent years so this song does nothing to surprise us. The lyrics are good listen though. 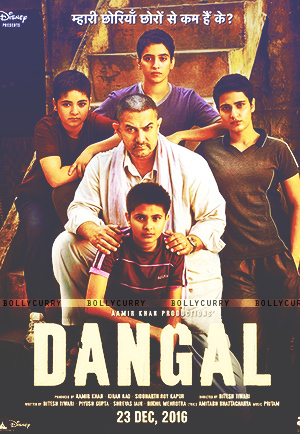 The fourth track is the titular track "Dangal". Sung by Daler Mehndi, the song seems to be the anthem of the movie. The music is strong and simple. The lyrics are power packed and emphasizes on the sport of wrestling. Overall, the song is good but not as good as the first two. The next song is "Naina". Sung by Arijit Singh, it is a sad song with threads of hope, loss, uncertainty and desperation mingled into it. Despite having Singh sing this song, the song fails to leave an impact on us. The music seems average and the lyric are good but does not hold our attention. The album comes to a close with "Idiot Banna". The song, sung by Jyoti Nooran and Sultana Nooran, is quirky and peppy. The lyrics are funny too. This upbeat, cheerful song is a definite addition to your wedding song playlist and us sure to make you laugh with its lyrics. Overall, the album turns out to be a bag of eclectic mix of songs. From casual to childish innocence, from silliness to aggressiveness, the album of Dangal takes us through a wide range of emotions. Some hit right on target while others sadly miss the target. However, the album needs to be heard at least once for its sheer variety, therefore BollyCurry gives this album 4 out of 5 stars! Dangal is coming to your theatres on 23rd December and we implore you to go and watch this awe-inspiring, women empowering movie. But till then, check out the album, listen to the songs and let us know what you think! Editors: Dhanya S. and Jenifer A.